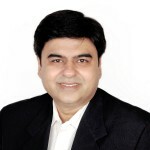 Pareekh, how would you describe the current state of Telecom Operations As-a-Service? We describe this market as a under-penetrated market. Our research suggests the current global telecom operations market (i.e., business processes under network, fulfillment, assurance, and billing) is perhaps one-third of $10 billion potential. The telecom market is perhaps only vertical market with the dubious distinction of both enabler and victim of the digital transformation. Telcos have enabled cost-effective communication with likes of WhatsApp, Skype and in turn, they have eaten telco's lunch. Telcos worldwide are struggling to find their right place in the digital world. As-a-Service solutions can enable service providers to help telcos to prepare for the digital era. The As-a-Service is the model today and for the future in telecom operations services. Tier 1 telcos have generally been early adopters of telecom operations services. Now, there is an opportunity to provide services to Tier 2 and Tier 3 telcos, too leveraging As-a-Service solutions. As-a-Service solutions are driving growth in this market. The eight service providers we evaluated for this Blueprint approach this market in essentially two ways. Service providers with strong IT offerings focus more on non-voice solutions whereas pure-play BPO service providers focus more on voice-based solutions. Service providers with strong IT offerings have taken the lead in platforms replacing legacy stack, plug and play business solutions, intelligent automation, holistic security, design thinking, and collaborative solutions while analytics and social is on the agenda of all telecom operations service providers. 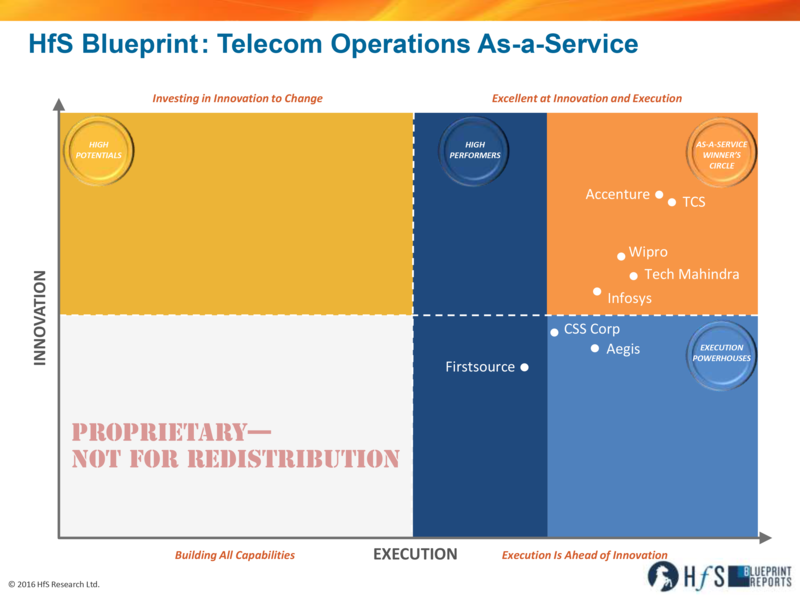 How has that changed since our inaugural Telecom Operations Blueprint in 2014? Even back in 2014, we could see many ideals of As-a-Service present in service providers’ offerings. In the last two years, As-a-Service momentum has accelerated. Compare to our analysis couple of years back, we see the rise in collaborative engagements driving business outcomes. Analytics is now embedded in most of the engagements. Service providers are launching new services incorporating design thinking. We see more examples and use cases of automation. Also, telecom operations service providers are becoming effective brokers of capability by partnering with IT, platforms, local construction companies and telecom domain experts. We see industrialization of few new service offerings such as network rollout management, revenue assurance in last two years. Also, service providers are constantly innovating with developing further new offerings to solve telco's pain points incorporating design thinking. The heartening development is that we see elements of As-a-Service ideals in new contracts more than in existing contracts. These new contracts are either of new greenfield operators or MVNOs. We see some existing customers moving to As-a-Service ideals when renegotiating deals with revised scope. Tell us, Pareekh, which service providers are leading this market today? The service providers in the As-a-Service Winner’s Circle are the providers that scored highest on both Execution and Innovation and included: Accenture, Infosys, TCS, Tech Mahindra and Wipro. These service providers are all process experts and stood out for the excellence of delivery operations, solution expertise for all telecom operations processes, the plans for As-a-Service, usage of platforms, and investment plans. We identified two service providers as Execution Powerhouses—CSS Corp and Aegis—both new to our 2016 Blueprint that excel today in the execution of telecom operations services and are making investments in innovation that should enhance future operational solutions as well. Finally, we also identified one High Performer service provider in Firstsource, which is leveraging its expertise as a pure play BPO service provider in delivering services in different channels for telcos too. All service providers are offering capabilities to meet the needs of today’s telecom customers. What can you predict will happen in the next 2-3 years for telecom operations? The first is that analytics offerings will evolve from operational analytics to business analytics. Some service providers already embed analytics in their all engagements. We believe analytics will become all pervasive for all tier-1 service providers. The second is that intelligent automation and, in particular, robotic process automation (RPA) will become deeply integrated into telecom business processes reducing the size of current labor arbitrage–centric contracts. The third is that with automation, omni-channel and self-service initiatives the share of voice channel will decrease. Subscribers will use voice for complex issues. So while the share of voice channel will decrease, the average handling time (AHT) will increase and service providers will require higher quality talent to support it. The fourth is that network rollout management offering by service providers will become extensive. Also, we will see introduction and maturity of new telecom operations services offerings. Service providers will figure out their value proposition in IoT value chain and support telcos in capitalizing on IoT opportunity. HfS readers can click here to view highlights of all our 39 HfS Blueprint reports. See our plans for 2016 Blueprints here.